In today’s world where time has become a valuable commodity, being able to move around quickly and easily has become important. Electric scooters are a novel solution to this dilemma – they are light, small, portable, and fast. To top it all off, they are a lot of fun to ride. The entire point of electric scooters is getting from Point A to Point B, but for some people, getting there FAST is an equally important part of the equation. 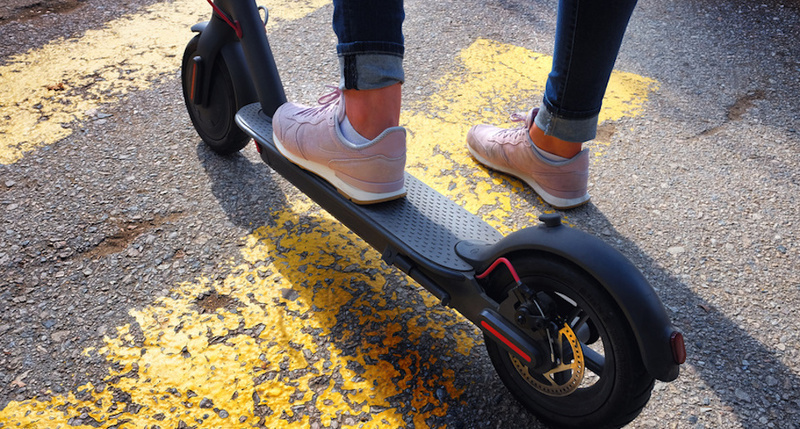 If speed is the name of the game, then you do not need to look further than this list we have compiled of the fastest electric scooters available in 2019. With a top speed of 52 mph, the powerful LS7 from NANROBOT takes the title of being the fastest electric scooter available today. It is powered by twin 1800W motors in the front and rear wheels. This all-wheel drive mode helps the LS7 achieve speeds that can be considered over the speed limit in most small neighborhoods. This electric scooter has a folding mechanism that allows folding and unfolding in a matter of seconds. It weights a total of 84 lbs – a bit too heavy for one person to lift, so it isn’t exactly a portable model. At such speeds, a reliable braking system and an array of safety features are critical. The LS7 does not disappoint in this department. 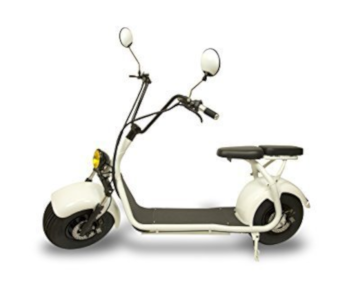 It has a dual front and rear hydraulic disk braking system and an electronic braking system (EBS) that slows down the scooter steadily in case of emergency braking. 11-inch pneumatic tires and a rubber shock dampening system provide excellent shock absorption and anti-slip capability in case of bumpy terrain or wet surfaces. A 35 Ah 60V lithium battery allows the LS7 to travel a maximum of 56 miles in a single battery cycle. This distance is more than enough for the typical commute, so you probably will not need to charge this electric scooter’s battery every day. Charging the lithium battery to full capacity takes about 5 hours. The major drawback of the LS7 being the fastest electric scooter in this list is that it is also the most expensive. 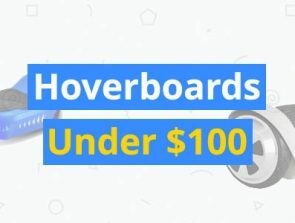 In fact, it costs almost twice as much as the second most expensive scooter in this list. 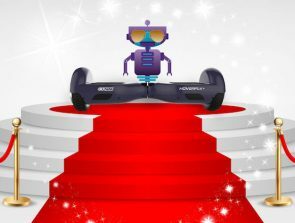 As if taking the top spot in this list was not enough, the second fastest electric scooter of 2018 also comes from NanRobot. With twin 1000W motors in the front and rear wheels, the NanRobot D5+ is capable of reaching speeds of up to 40 mph. 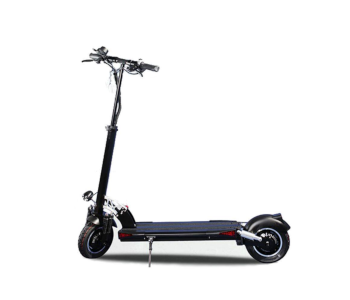 It is powered by a 26 Ah 52 V battery that allows a maximum distance of 52 km. Should you need to conserve battery power, the D5+ allows for switching between single drive and dual drive with the click of a button. A pair of 10-inch tires with a reliable shock absorption system allows for smooth driving even in uneven terrain. A hand brake engages front and rear disk brakes, ensuring your safety even when traveling at the scooter’s top speed. Similar to other Nanrobot electric scooters, the D5+ features a quick-folding mechanism that allows you to engage or put away the scooter quickly and with minimal effort. Having two motors weighs down the D5+. At a total weight of 70 lbs, the D5+ is not exactly what we would describe as portable. 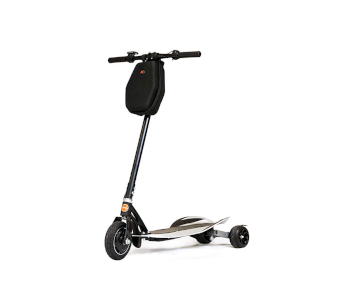 Still, it’s a relatively affordable mobility tool that provides excellent safety and control, on top of being one of the fastest scooters in the market today. The Q1 Hummer manages a top speed of 35 mph with an 800W motor, clearly punching above its weight class. It is powered by a 26 Ah 5-cell lithium battery that gives it up to 60 miles travel distance in a single battery cycle. This distance is longer than most other drones in this list – the Q1 Hummer seems to have sacrificed some speed to provide extra battery life. However, the Q1 Hummer is no slouch in the speed department. The 35-mph max speed should be fast enough even for the most experienced electric scooter users. The scooter is supported by an array of safety features, including the dual disk brake system and a provision for brake lights in the rear end. Each wheel assembly is also supported by a dual shock absorption system. Whether on smooth pavement or on rough ground, the Q1 Hummer has got your back. Folding the Q1 Hummer is made even easier with a unique 2-second quick folding mechanism. At 55 lbs, it is a little lighter and more portable than its faster electric scooter counterparts. It also comes with some unique features, such as an anti-theft system and a USB charging slot for your cellphone. Overall, the Q1 Hummer is a solid choice for its price range. It may not be the fastest, but we don’t think anyone will classify 35 mph as slow. In terms of distance traveled per battery cycle, it has the advantage over most of its rivals. The bonus features, especially the mobile device charging port, are also a nice touch that shows how Qiewa anticipates the needs of its customers. If riding on a scooter that kind of looks like a Harley is your thing, then the eDrift Fat Tire Scooter is the perfect electric scooter for you. This is a bulky and heavy scooter that gives no pretense about being portable – this model is all about power. With a 2000W hub motor, the Fat Tire Scooter can reach speeds of up to 30 mph. It can travel up to 65 miles in a single charge of its 30Ah 60V battery. The focus on power extends to its load capacity because this scooter can transporters passengers weighing up to 350 pounds. Cruising city streets using the Fat Tire Scooter is made easier with its smooth and responsive controls. The Fat Tire Scooter was designed to be easy to learn, so it should not take much practice to handle it like an expert. The Fat Tire Scooter boasts of a rugged braking system consisting of dual hydraulic disk brakes. The unique advantage of the Fat Tire Scooter lies in its Harley-like design. The cushioned seats make traveling in the Fat Tire Scooter much more comfortable especially if you have to drive for more than 50 miles. The fat tires also provide more contact and better grip with the ground, making the scooter more stable and secure even in slippery conditions. With a focus on power and aesthetic appeal, the Fat Tire Scooter is the 2nd most expensive item in this list. It may not be the fastest, but there is no doubt that the Fat Tire Scooter is a comfortable and stylish ride which stands out from the rest. The electric scooter from MASSIMO is a low-cost and basic electric scooter that is surprisingly capable of speeds of up to 30 mph. Its 350W motor pales in comparison to the power of the faster drones in this list, but the KXD Moto is also much lighter at just 30 lbs. The combination of this scooter’s light build and foldable design makes it one of the more portable electric scooters in this list. Being a lightweight scooter also makes the power consumption of the KXD Moto much lower. However, it just was not built for long-distance travel – a single charge of the battery can only let you travel for up to 5 miles. Charging the battery to full capacity takes around 4.5 hours. What the KXD Moto does not skimp out on is safety and stability. The front 8-inch wheel provides enough shock absorption even for the roughest roads while double rear tires keep the scooter remarkably stable. The KXD Moto also features a smart digital display that shows real-time speed, mileage, and battery power data. 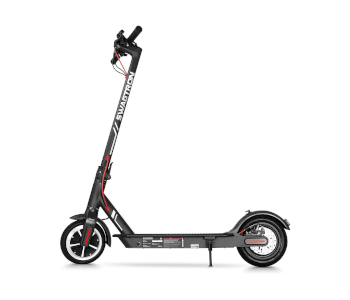 If you are not comfortable with the idea of spending a lot of money on a motorized scooter, then perhaps the Swagger 5 from Swagtron will be affordable enough for you. 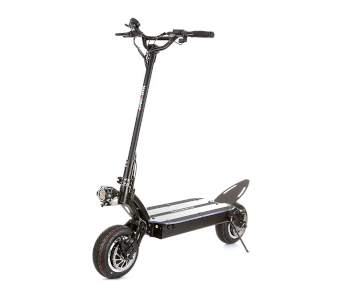 Its 250W hub motor allows the Swagger 5 to move at speeds of up to 18 mph as well as to climb inclines of up to 20 degrees. With a foldable design and a frame that weighs only 27 lbs, the Swagger 5 can be very easily brought with you on a train or bus. 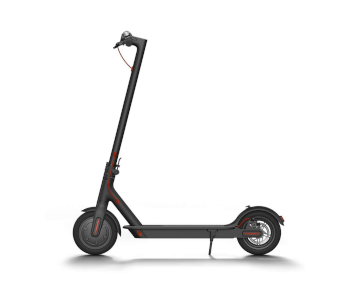 The lithium-ion battery of the Swagger 5 can allow travel of around 8 to 9 miles, although this heavily depends on the weight of the scooter’s load. The Swagger 5 has the very unique capability of connecting to your mobile phone via Bluetooth using the Swagger 5 iOS or Android app. With the app, you can shift gears on your scooter, active cruise control, check your location via GPS, measure your speed, and turn on your headlights. With the phone mount integrated into the controls of the scooter, you can turn your mobile phone into a high-tech display. Despite all the high-tech innovation, Swagtron has not forgotten to excel on the basics. The frame of the Swagger 5 is made of high-grade, durable aluminum that can support a weight of up to 320 lbs. It comes with safety features such as a headlight and a brake light, as well as dual ABS e-brake and rear disk brake systems. 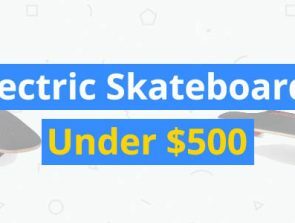 The Swagtron Swagger 5 gives real value for money. At an affordable price, it delivers a premium electric scooter that is fast, safe, and a lot of fun. It may not be made for long distance trips but makes up for this drawback with innovative mobile app connectivity. The Mi Electric Scooter from Xiaomi is one of the most popular and best-selling electric scooters in the market today. Its max speed of 15.5 mph on a 250W motor is nothing too impressive but makes up for it with a high-capacity battery that allows travel of up to 18 miles in a single battery cycle. With an aerospace-grade aluminum build, the Mi electric scooter weighs only 26.9 lbs. Coupled with a foldable design, the Mi electric scooter is very easy to store or carry by hand if necessary. The secret of the Mi electric scooter lies in the regenerative energy technology that converts and stores kinetic energy generated during acceleration to additional battery power. Just for this level of innovation, the Mi electric scooter deserves to be on any list of the best electric scooters in the market. 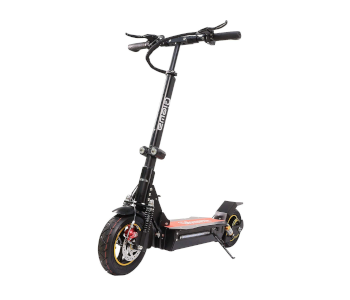 The Mi electric scooter is an exceptionally easy model to learn with its intuitive and simplified controls. It is designed for use by all ages. With ultra-bright headlights and brake lights, using the Mi electric scooter at night does not present a safety hazard. It also features a double braking system consisting of disk braking and an eABS anti-lock braking system, resulting in a responsive braking distance. The Mi electric scooter can also be paired to a mobile app via Bluetooth. With the app, you can view the scooter’s speed, mileage, remaining power, and other interesting statistics. It’s a fun little tool that is kept updated through firmware upgrades, ensuring that your riding experience is always optimal. The Xiaomi Mi electric scooter seems like a fairly standard electric scooter at the surface. With its affordable price tag, some innovative technology such as energy regeneration and app connectivity set it apart from other electric scooters in the same price range. If you can make do with a somewhat slower but similarly reliable model, then you can hardly argue with the thousands of sales of the Xiaomi Mi Electric Scooter. Whether you intend to use an electric scooter for your daily commute or just for fun, you have to admit that faster is better. However, speed isn’t the only thing that counts. More power usually comes with the consequence of making the electric scooter heavier, even to a where they cannot be considered portable. Some electric scooters also have unique and useful features, such as mobile app connectivity for real-time monitoring of the scooter’s parameters. 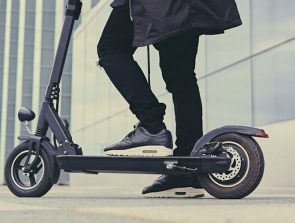 We hope this guide helps you pick just the right electric scooter for you in terms of the max speed, price, portability, and other safety and usability features.